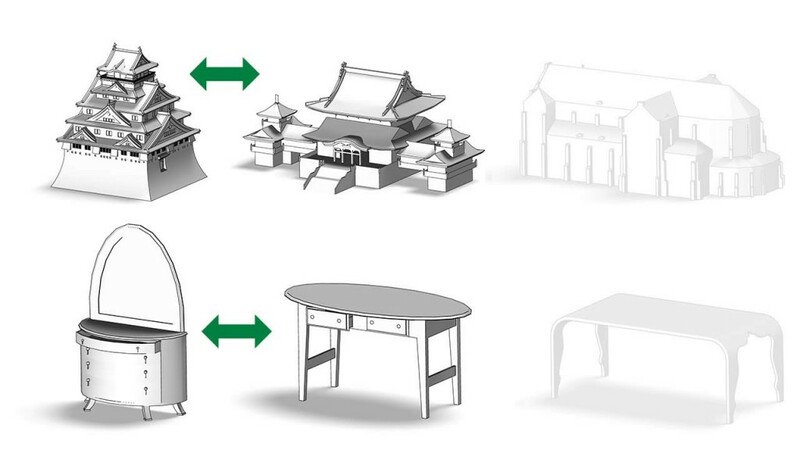 Can we train CAD software to recognize not only primitives and topology…but style? Right now, your CAD program doesn’t have much sense of style. Not like you do. Imbibing it with style won’t necessarily give it better taste, but could speed CAD design. A program outfitted with a trend-seeking algorithm would find intuitive links between geometries and shapes that differ in structure, but are similar in style. Humans perceive similar shapes in a manner that goes beyond the shape’s structure and function. You can tell that a bed and a dresser are both Mission style, for example; your CAD program cannot. That’s the point three computer science professors who presented recently at ACM Siggraph 2015, the August computer graphics conference held in Los Angeles. Rather than grouping geometries within the same class, the researchers’ algorithm analyzes and groups them by perceived similarity, much as humans do. The researchers are Alla Sheffer, a professor of computer sciences at University of British Columbia; Evangelos Kalogerakis, an assistant professor of computer sciences at University of Massachusetts, Amherst, where researcher Zhaoliang Lun is a computer science Ph.D. student. To allow an algorithm to translate and group shapes by style rather than grouping them with similar shapes, researchers first needed to quantify in geometric terms what it is that makes geometric elements be perceived as similarly shaped. Interestingly, the researchers turned to writings about art history for this, where buildings and objects from similar time periods and places are referred to by their recurring shape, proportion, and line. Think about a Baroque building versus an Asian temple for example. You intuitively know the buildings’ shapes, proportions, and lines classify their styles and make one type of building much different than the other. But your CAD software doesn’t understand what makes them different. But, turning to modern methods, then they went on to crowdsource for answers by asking 2,500 people determine which of two object most resembled an initial object. They gathered 50,000 responses and used them as inputs that measure distance between elements within a shape and the shape’s proportion and lines. The algorithm can successfully group Asian temples, Byzantine churches, Gothic cathedrals, Russian churches, and Baroque-era buildings by type, Kalogerakis says. The algorithm has obvious use for architects, who could use CAD programs that run the algorithm to quickly and easily match building features and styles, and for interior designers who might be looking for a certain style sofa to place in a CAD design. And it can make design engineer’s jobs easier too, as they could more speedily find the geometries and parts from parts libraries they seek for their designs and assemblies. In fact, one day a computer graphics program could be able to tell—after a quick search of online fashions shoots–whether that shirt you plan to wear to work fits with current trends. Or not.